Mayor Rob Ford is lashing out against fellow councillors amid allegations he used paid members of his staff to help run a trio of football teams. 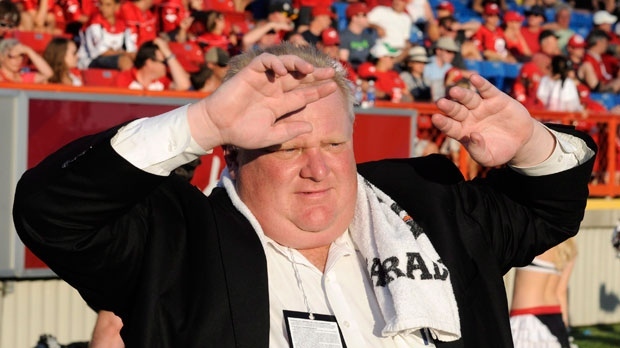 A report published in the Globe and Mail Wednesday said two of the mayor’s special assistants helped out with the day-to-day running of Ford’s minor football team, the Rexdale Raiders, this past summer. The report also says another special assistant, a former quarterback for the University of Toronto Varsity Blues, is helping coach Ford’s high school team the Don Bosco Eagles this fall. The report resulted in criticism from several councillors, including Coun. Adam Vaughan who called Ford a “hypocrite” in an interview with CTV News. In a statement issued Wednesday afternoon Ford fought back, calling anyone criticizing his staff “a coward,” however he did not directly address allegations that staff members helped out with his football teams during work hours. The same statement did say that members of Ford’s staff accompany him at “most times” to assist with official business. According to the Globe and Mail report, Ford assistants Isaac Shirokoff and Chris Fickel were listed as contacts on a Facebook page for the Rexdale Raiders. Their cell phones, which are funded by taxpayers, were provided as contact numbers for anyone seeking additional information about the program. “That’s how I run my office, but I don’t run the mayor’s office,” he said. Ford’s football-related work has been the subject of much debate recently. Just last week Ford took the stand to defend himself in a conflict-of-interest trial that could see him removed from office. That trial revolved around an allegation that Ford acted improperly when he voted to toss a ruling that would have required him to repay donations he collected for the Rob Ford football Foundation using councillor letterhead. A judge is currently deliberating the case and isn’t expected to come up with a verdict for months.